Content You Need: Vive l'IRCAM! World events – particularly those that involve violence or danger – have a way of making the world suddenly smaller in an unusual way - great city populations may suddenly collapse to your N closest acquaintances living there (or nearby), and then expand from there after the initial wave of worry passes. In addition to thinking about introducing you to Max content you may not know about, I’ve been thinking about my French friends this week and came to realize that this would be an opportune time to shout out to the City of Lights, and introduce you to (or remind you of) the work of our friends at IRCAM. Aside from (cough cough) just a little bit of history, all those works composed at IRCAM and the fact that there's IRCAM DNA woven into every single Max (and Pd) patch in this arm of 3-space, IRCAM (like CNMAT) is a repository of some amazing resources for Max programmers. 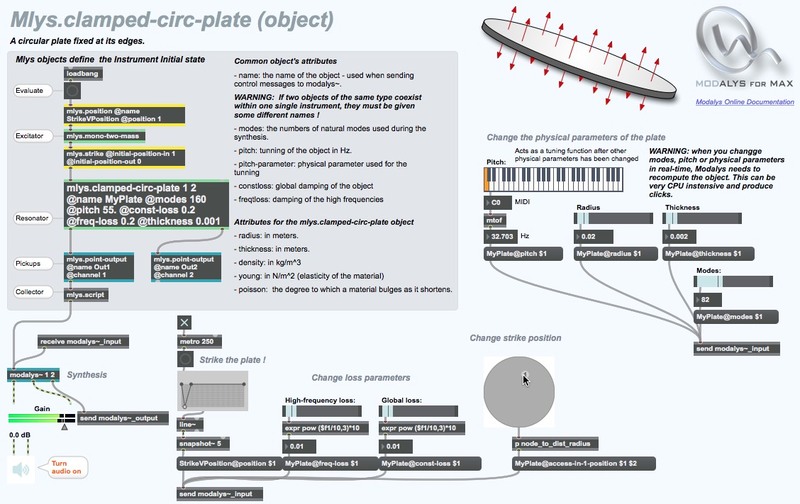 Many of you have probably heard of IRCAM by way of the IRCAMax Max for Live devices or the IRCAM Forumnet's Max-based software tools (and applications) you can purchase, I'm sure (more on this in a minute, but I'll just say that it might be worth your while to read all the way to the end of this posting). But there are also a couple of amazing and inspiring tools you can download and use for free, too. Max for Live users can find a couple of free Max for Live devices (which you can now integrate into your Max patching in Max 7 by means of the amxd~ object) here. 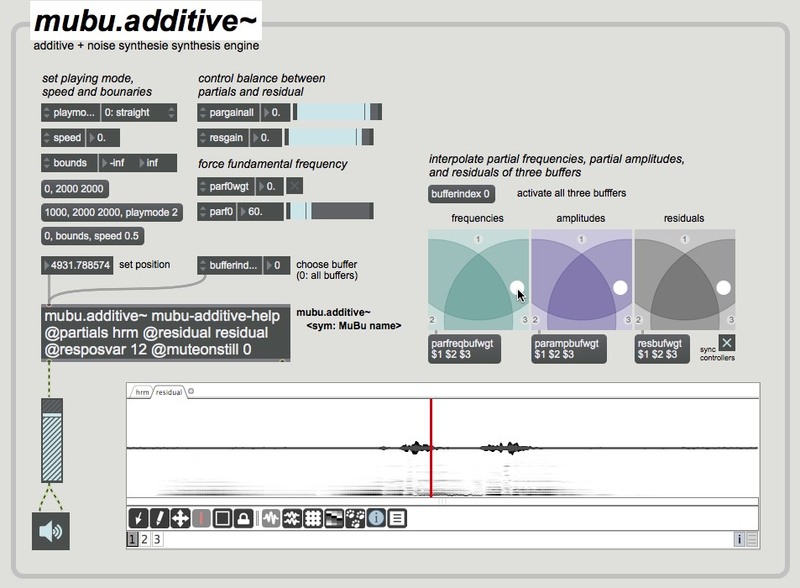 MuBu is the most interesting free IRCAM download for me, personally - a multibuffer container for sound and motion data. You can find a description of it in presentation form here. My suggestion is that you finish this entire posting before you download it and start messing around with the help files and examples - otherwise, you'll have to start reading this blog post from the beginning when you emerge from knocking about sometime next week (and no, I'm not kidding). 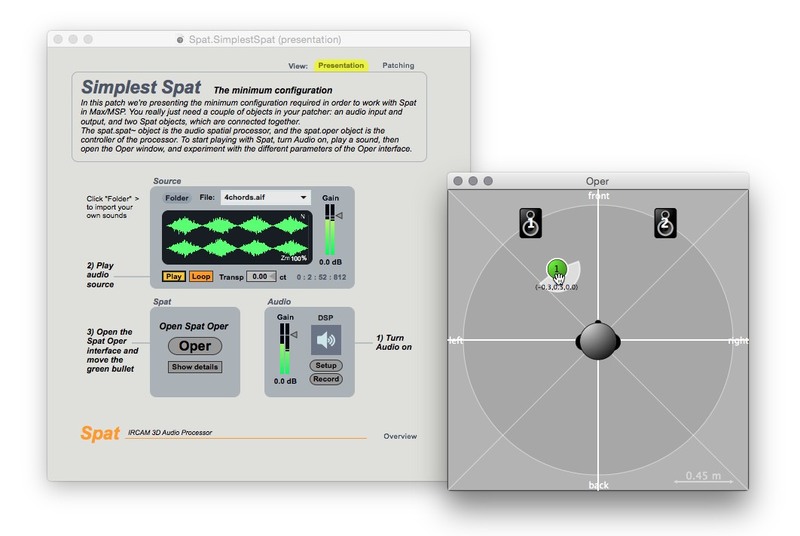 In addition to the enjoyable and inspiring free stuff, you can purchase software tools from IRCAM, as well (I tend to think of it as having the people who made the IRCAM's spatialization objects, phase vocoders, or IRCAMax plug-ins helping me with my Max patching). Assembling the "Content You Need" blog series is often an opportunity for me to approach or re-acquaint myself with Max tools I've been away from for awhile. While this often involves the humorous discovery that something I've been working on for a while has been free and available for download for ages and I'd forgotten about it, also the case that revisiting a collection is an opportunity to see what's changed about it since the last time I looked. 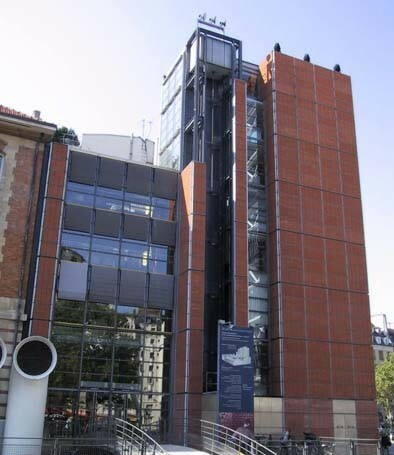 And I'm glad for the opportunity, in this case - since I last visited the IRCAM Forum, a number of the Max tools available there have been the recipient of some serious love and care. 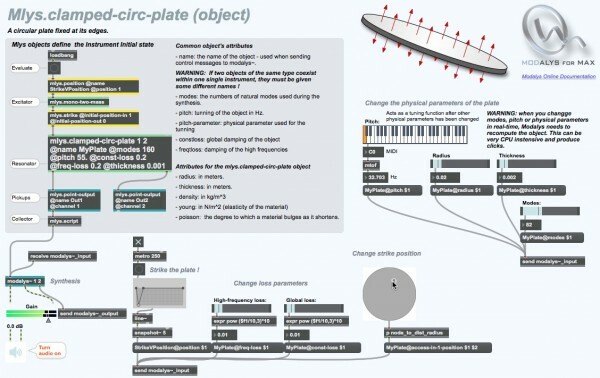 Here's an example: a while back, I did an article on the various tools for physical modeling synthesis for Max users. In conjunction with that, I spent some time with Modalys, their set of physical modeling tools for MSP. The updates since then (there's a very recent update, in fact) are really impressive - helpfiles redone and redesigned in ways that make it a lot clearer how the various Modalys objects interact, better tutorial material, and more efficient versions of the objects. It's a really nice makeover. 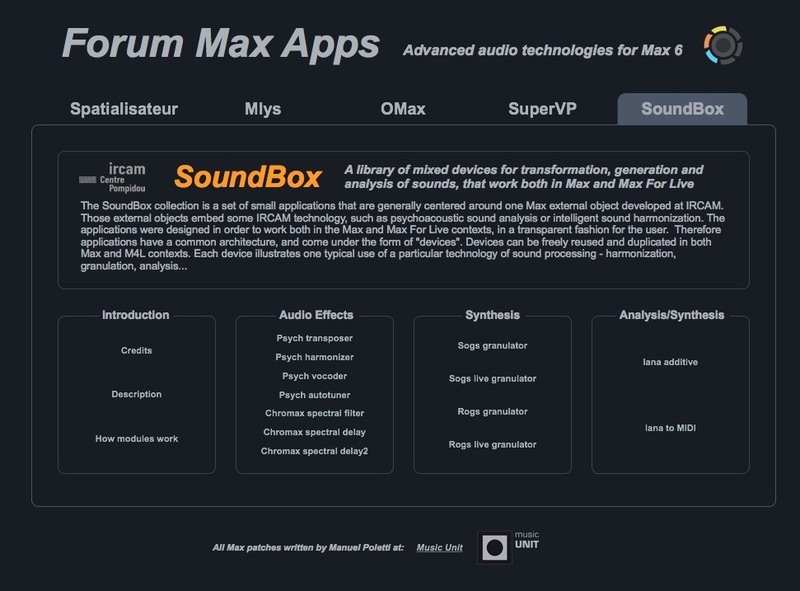 I suppose that some of you already know this - for our newcomer friends, the Max world is full of people who joined the IRCAM Forum to get their hands on one thing: Spat - the IRCAM collection of MSP objects for sound spatialization. To this day, it remains a beautiful set of resources that scale to match your situation. Like Modalys, there's been some recent attention lavished on the help files and tutorial materials here, too. It speaks for itself, from any point in the room. Lots of Max 7 users are already enjoying the new tempo sync and pitch elasticity features available when working with buffer-based materials in MSP. No wonder - the decoupling of the pitch and time domains is one of the computer music world's great playgrounds. 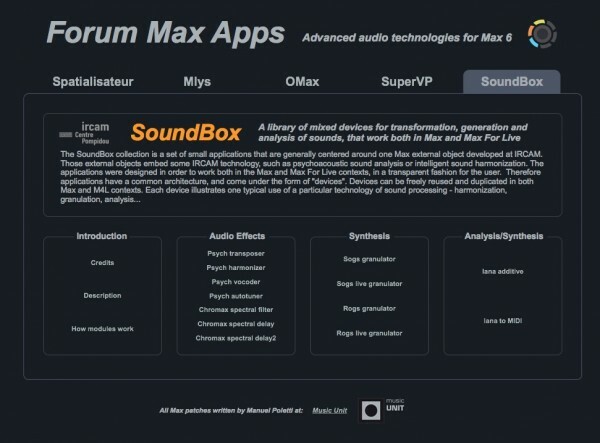 The IRCAM Forum software includes a flavor of that - a Max external that implements a phase vocoder. 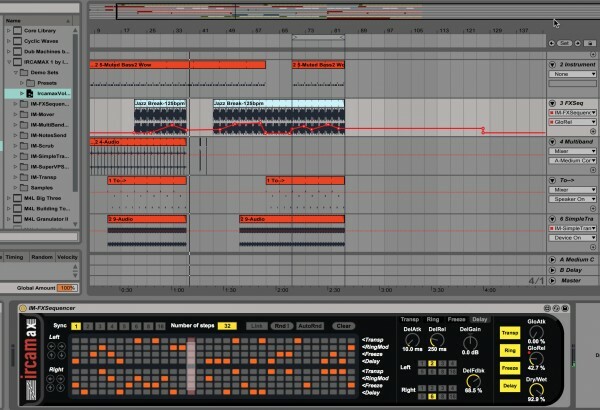 Simply put, the algorithm splits signals into sinusoid, noise and transient components and lets you manipulated each of the three components individually. As with Modalys and Spat, nicely updated help files and accompanying materials, too. 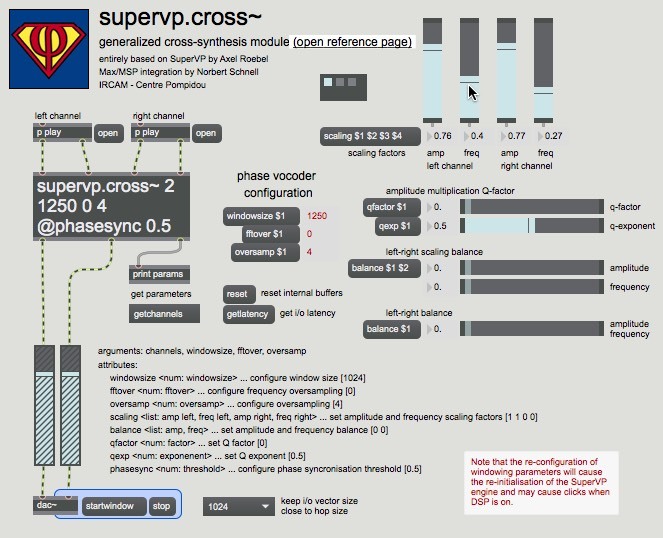 If you're a Max for Live user, I ought to note that the SuperVP stuff is at the heart of the IRCAMax bundle - a half dozen audio effects (awesome sequencers, delays, transposers, and scrubbers) and a phase-vocoder-based sampler instrument for Max for Live. You can see the Max for Live devices in action SuperVP software is at the heart of the here. Wow. I've gotta stop somewhere - I'm hyperventilating. Anyway, I hope that you can find something here that will delight and inspire you. Here's my official "I can't believe I didn't know about this" moment for those of you who may already be Forum software users: if you want to get up to speed about the new stuff, run, don't walk and download and install the Forum Max Apps extra patch. It'll give you a great single-panel interface (a la the Examples Overview in your Max 7 Extras menu) to navigate the software and tutorial materials. It's the mother lode. Srsly. ...here's a little something for you: Entering Cycling74Fall15 as a coupon code on the IRCAM Forum order page will give you a 20% discount on the cost of a Forum premium subscription, which may be even better than a bottle of organic wine from the Loire valley. You cannot use this voucher anymore (usage limit attained). The coupon should be working fine now. Thanks for noticing. I'd love to see someone have a go at some Mubu Tutorials or something- it seems like some powerful business, but it's pretty hard to get some reigns on! mubu tutorials, please! i am all thumbs with this package which is incredibly powerful. it's not easy to wrap my head around, though.